Easter is a little over one week away and I've (shockingly) had the girls' baskets done for a while now. 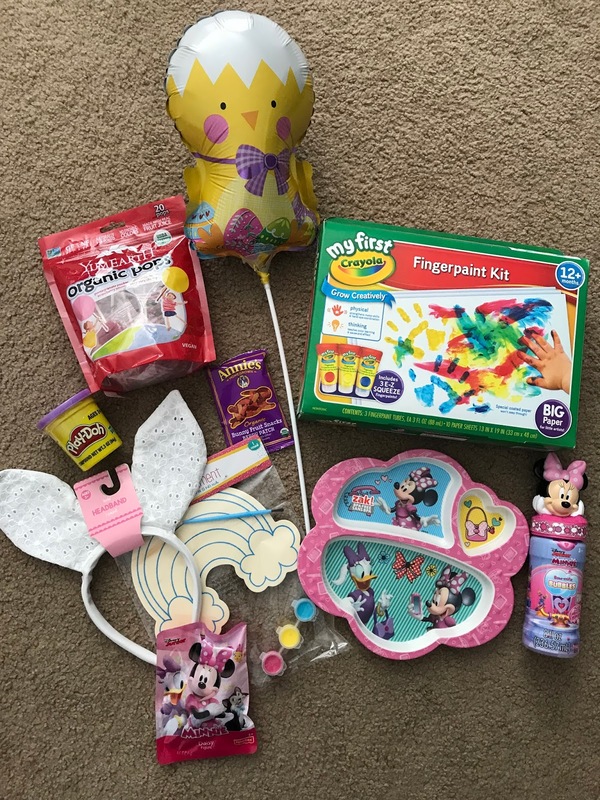 I got started early this year and picked up things as I saw them, so I thought I'd share what each kiddo will find in her basket on Easter morning! I apologize for the low quality of the pictures and that I don't have photos of their actual baskets, by the way. I had to sneakily take these pictures as quickly as I could so I wouldn't risk ruining the surprise! Each girl has a white wicker basket with a cute liner from Homegoods. Obviously (and much to her disappointment), she won't be getting the entire bag of jellybeans or bouquet of Tootsie pops -- but I'll put some jellybeans in plastic eggs throughout her basket and include a lollipop or two. 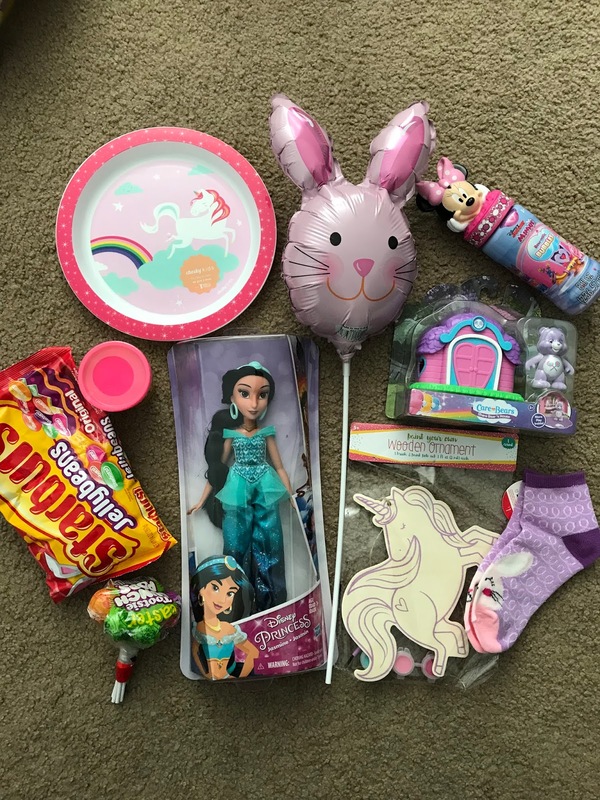 My unicorn-obsessed girl will be getting a new plate and ornament paint set from Target, bubbles and bunny socks from the dollar spot at Target, a Princess Jasmine doll (she recently watched Aladdin for the first time and loves Jasmine right now! ), a pink playdough, a mini CareBear house from the Barnes & Noble toy section (they have the best stuff! ), and a little balloon from Walmart ($1!). Hadley will be getting a few YumEarth Organic Lollipops (our favorite brand - found these at Homegoods! ), an Annie's fruit snack pouch, a purple playdough, Minnie Mouse bubbles and a bunny ears headband (both from the dollar spot at Target), a Minnie plate from Target, a rainbow ornament painting kit so she can do it alongside her big sis, a little Daisy figurine, a finger paint kit which I think she'll have a lot of fun with, and her own mini balloon from Walmart ($1!). 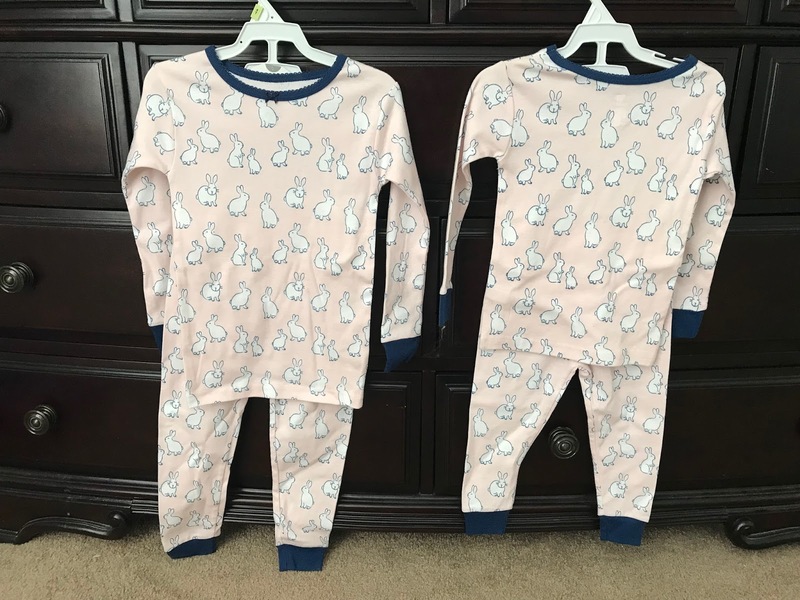 Also, check out these adorable matching bunny jams I picked up on crazy clearance (probably from last Easter!) at Babies R Us back in January! I think they came to about $2.50 a pair. Tell me about your baskets! Do you have them ready to go? Happy Thursday, friends! Thank you so much! It is so fun to hear about all of your traditions. I'm not familiar with egg rolling or those Easter treats! I love the tradition of a nice Easter dinner, though. :) We usually host here and make a ham but this year I think we'll be traveling. I am SO with you on hiding the eggs (and in our case, the baskets too) -- it really does make you feel like a kid again. There's something about the thrill of the hunt! Those are the cutest pjs. I love them. My mom would hide our baskets and eggs around the house. I always loved that so that is the tradition I am carrying on. I love the things you got the girls. My girls won't be getting the full bag of candy either. Only a few. Thanks! I couldn't believe the deal they were -- I had to scoop them up! I love that tradition. I think there's something just so fun about having to hunt for your basket and eggs, of course.